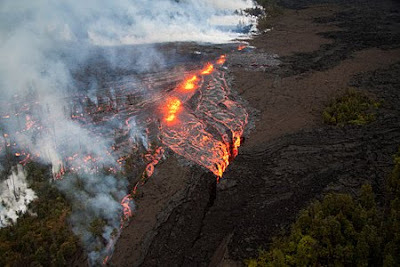 Above is one of the many spectacular images that USGS/HVO crews have been documenting of the new eruptive fissures that are located between Pu`u O`o and Napau craters. I highly recommend checking out their new photos and videos and captions of this event on their IMAGES page. Their photo updates are images recorded yesterday. I believe the fissures are perhaps less explosive today, but I only base that on watching their new fissure cam, which may be very deceiving as to what is taking place on the ground along the fissures. I have not been able to hike out to the coastal plains to see just how much lava may still be flowing; it has been raining very hard here. 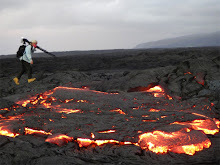 Reports I have received for the area say the lava has stopped flowing on the surface, but remains hot and steaming from the rains. 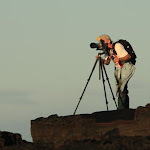 I will be compiling a set of video clips of the past month of coastal flats surface flow action for the local Big Island Video News and also post that raw video and the news version on here in the next few days. No one knows what will happen next with the magma changes and lava eruption sites, but we are all excited to find out! Until the surface flows are coming down the Pulama Pali or onto the coastal flats again I may not have as many updates, and will not have any new photos for you. 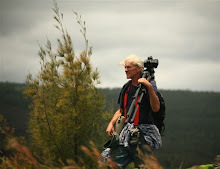 I will not be hiking into the eruptive fissure zones that are currenty remote and inside National Park bouderies. 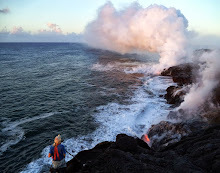 To keep up with the activity within Hawaii Volcanoes National Park and the rift-zone eruptions you can follow the USGS/HVO daily reports. Thanks for keeping up posting even when you don't have first hand access to this eruptive area. Reminds me of January 83 when this all began!